EEK, A TYPO! : Typo? Or DENIAL? 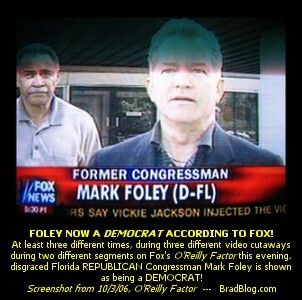 Former Republican Congressman Mark Foley's follies has Fox News caught in a spin. What, he ain't Republican no mo? Apparently, Fox News did this several times. Later on, a correction was made, in the form of removing the copy entirely, not by replacing the D with an R. Classic! Thanks to The Brad Blog for the item.